A spatial, rhythmic, audio-visual experience of pure ecstatic joy! Think of Holodance as a music video that you can enter and play with. But it's not just a 2D video - it's an actual reality that touches hearing and seeing and hopefully your heart! This research and development game explores the possibility of having players travelling through a labyrinth that is built of tiles the size of the physical space they are using and connected via teleporters. 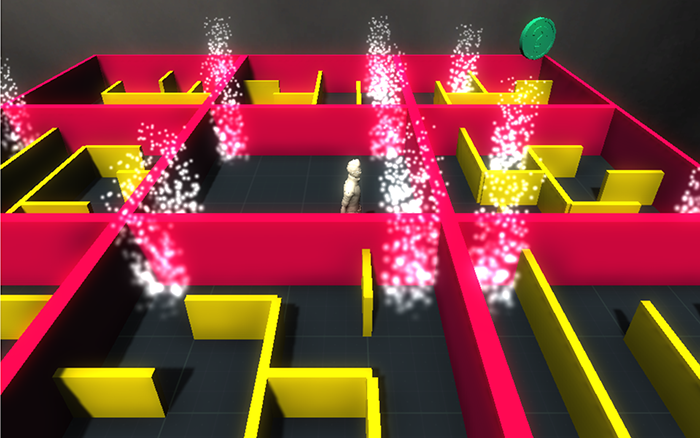 Each teleporter transports the player back and forth between the same relative location in another tile. That way, a large game space can be explored while actually walking only a 3 x 3 m (15 x 15 ft) space. Once we have an actual proof of concept for the navigation working well with smaller and larger rooms, actual game mechanics for singleplayer and multiplayer exploration games will be added. 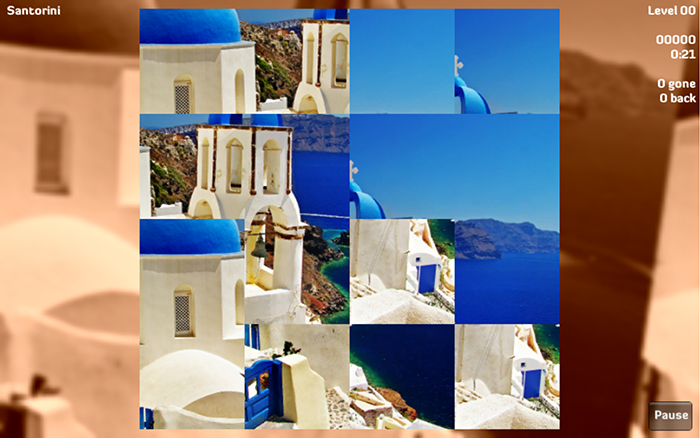 Tapuzzle is a 3D-puzzle game that could be described as Rubik's Cube meets Crackers: Remove one top cube after the other to find the one that reveals the correct part of the image at that particular location - eventually, the whole image is revealed. While you can always safely cycle the cubes through, you can also drop a cube out of the game. If it was the right one (that does not belong to that location), this speeds up cycling through the cubes and gives you score - but if it was the wrong one (the one that belongs there), you immediately lose. This game was originally designed for touch-screen displays but should also work fairly well with huge cubes that you can pull from the top with your arms in VR. A prototype of the game for desktop and mobile works fairly well, first VR experiments have been quite promising (this will work with the Razor Hydra for now, possibly also Leap Motion). You can try the desktop variation (left click to cycle cubes, right click to pull them off the stack) in the Tapuzzle Webplayer. While wearing a head-mounted display that is connected via wires does prohibit certain Yoga and Chi Gung movements, it does give us the perfect multiperspective mirror when combined with precise motion tracking like using the PrioVR or Kinect setups. We can show the posture of the player anywhere the player can conveniently look, giving instant feedback about the correctness of the posture - and we can include the same posture performed by a professional Yoga / Chi Gung teacher. This works for any art of body movement that does not require moving faster than the head mounted displays and cables could handle (that means: no martial arts for now, even though we'd love to). Of course, this also makes it fairly easy to put the player into any beautiful environment to practice in. This project currently is in the planning phase.